The machine is a new product with high automatization which especially designed for middle and small pharmacy factory, hospital dosage room and health care factory. It adopts PLC Human Interface, frequency converter and digitization controlling and adjustable stroke, easy operation, long durability, small body but with full functions. 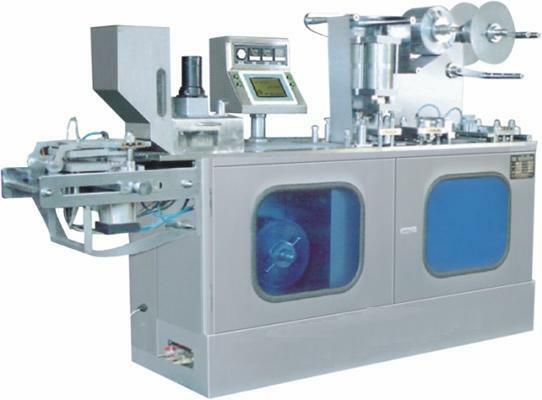 It is the ideal packaging machine at present, which is well welcomed by customers. The machine has passed the Province Science and Technology Production Authentication. 1. Main transmission part adopts swinging pin gear reducer having long life and lower noise and stable running. 2. Digitization and adjustable stroke, easy to operate, which suitable for different sizes packaging, especially for packing small batch but more kinds of products. 3. Plate structure, can pack some special shapes, such as oval, square and triangle etc. 4. Photoelectric color code checking (Option), servo motor tracking traction, image and word register which make seal formal and beautiful.